The most beautiful aircraft of World War II not only a successful design but a symbol of victory to the British people in their darkest hour was the legendary Supermarine Spitfire. -ments. He drew a short range interceptor with an elliptical wing form whose aerodynamic advantages would offset any production difficulties. Supermarine, a division of Vickers-Armstrong, received a production contract for the Spitfire in 1936 and began deliveries two years later. In the meantime, it became apparent that the RAF would want great numbers of the new plane, so Supermarine arranged its production facilities and sub-contracting relationships on a grand scale. By the time Britain went to war in 1939, 2,160 Spitfires were already on order. Production increased none too quickly. Having subdued continental Europe, Hitler turned his attention to Operation Sea Lion, the invasion of England. When his air offensive began in July 1940, Spitfires and the more numerous Hawker Hurricanes found themselves pitted against the Bf 109. The Spitfire Mark I was marginally faster at 362 mph but the contemporary Bf 109E could outclimb and outdive it. The result was a very even match, and the RAF began losing the equivalent of one fighter squadron per day. It seemed pilot attrition would decide the outcome in only a few weeks. Before this could happen, however, the German high command shifted its target to the civilian population of London. Then, in a great daylight raid on September 15 (thereafter to be known as Battle of Britain Day), some 300 Hurricanes and Spitfires cost the Luftwaffe so dearly that Hitler decided to postpone Sea Lion indefinitely. 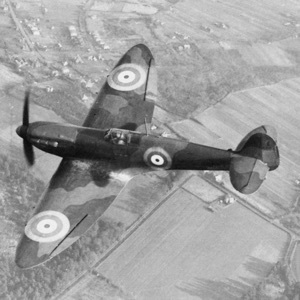 Supermarine continued to improve the Spitfire rather than introduce any other type of aircraft. In forty major variants, it explored every opportunity to improve aerodynamic efficiency and accommodate increases in engine power, armament and fuel capacity.